We have all been guilty of it. Straining our necks to see what is going on up ahead and trying to find out why traffic is at a standstill. The problem is sometimes our curiosity, also known as rubbernecking, can lead to disastrous results. If you or someone you know has been injured by distracted driving, rest assured that our auto accident attorneys will work diligently to get you the compensation you deserve after an accident. Call or text 1-800-706-3000 to schedule a free consultation. While rubbernecking is a natural tendency, it is dangerous because it takes a driver's attention from the road, which may result in another accident with severe injuries. Rubbernecking increases the chance of rear-ending another car. Distracted drivers often swerve into another lane or even oncoming traffic. 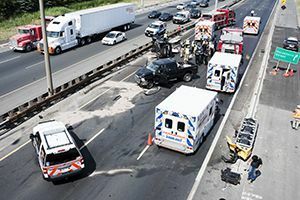 Looking at an accident scene instead of directly in front may cause a driver to miss traffic directions from police or other emergency personnel. Rubbernecking causes traffic to back up as curious people slow down to see what is going on. Officials say rubbernecking is also a main cause of traffic pile-ups. If a rubbernecking driver causes another accident, that person is liable for any injuries or damage that occurs. Also, a study conducted by Virginia Commonwealth University indicated that the act of rubbernecking was the main cause of accidents that involved distracted driving, and that statistic has not shifted much in the last decade. If you have been involved in an auto accident caused by a distracted driver, you may be eligible to pursue legal recourse for your losses. For more information on the legal rights which may be available to car accident victims or to begin exploring your legal options, contact a Phoenix injury lawyer from Phillips Law Group today to schedule a no-obligation case evaluation with one of our attorneys.